If you're a police officer or security worker, you need to keep OC/ Pepper Spray in reach for protection. 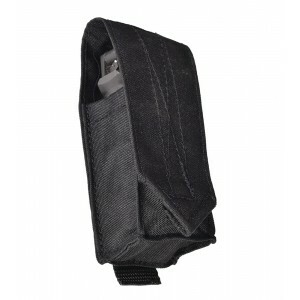 Our Molle OC/ Pepper Spray pouch is the perfect way to hold your OC and adjust it to where you'd like on your BlueStone Safety Custom External Vest Carrier or Load Bearing Vest. Our Molle pepper spray pocket is ideal for Law Enforcement and is reinforced with expert stitching, making it built to last. Includes two heavy duty snaps that secure your OC spray pocket in place. If you snap only the bottom snap, this will also fit around most standard sized belts so you can have your Pepper spray at your hip. PROUDLY MADE IN THE USA and built to last! Available in Green or Black and backed by our 1 year warranty for craftsmanship.